The Windsor Canada riverfront boardwalk across the Ambassador Bridge from Detroit is a very nice bike ride. It's perfectly paved and scenic. When I rode the path on June 6, 2011 when I took these photos there I even came across a really nice small restaurant right on the bike path that had a fantastic menu and service with seating inside or out. It's known as the "The Bistro at the River" and opened in summer 2007. A link to their homepage and menu is below. The trail starts right under the Ambassador Bridge in Windsor. From there you head east up the Detroit River towards Lake St. Claire. The path is well paved and easily wide enough for two lanes of traffic, which often includes bicyclists, rollerbladers, walkers, and joggers. This paved path travels approximately 2.75 miles until the intersection of Riverside Drive (which runs along the river like Lakeshore Drive in Chicago) and Lincoln Drive. After that, you can still continue several more miles on a smaller bike path on the shoulder of Riverside Drive. 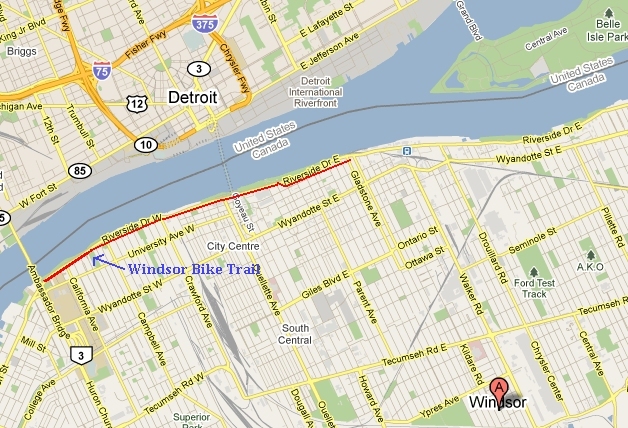 The difference is the actual Windsor Bike Path is much wider, more closely borders the Detroit River and has a very large grass/park-type medium between it and Riverside Drive. As you ride along the path, you'll have a very nice, scenic view of the Detroit River and downtown Detroit, including the Ambassador Bridge, the Renaissance Center, the Riverfront Apartments where many local Detroit athletes have apartments, and Chene Park where outdoor concerts are held throughout the summer. Along the path on the Windsor side is great variety. You'll pass the Windsor Casino, a lively Riverside Drive with restaurants, an art gallery, apartments, and beautiful greenery. The path is lines with all sorts of gardens, manicured bushes, flower gardens, and sorts of really nice statues, particularly of animals. These many, very nice sculptures are park of what's known as the Odette Sculpture Park. A link below contains photos of all the sculptures. At many points between the bike path and the river is space for fishers and the riverfront boardwalk is a popular location for fishers. I ride this path once in late May / early June and was completely taken a back by what I saw with respect to fishing. I stopped on the trail and in on 180 degree span of vision observed perhaps 15 fishers. And at any given moment, 2 to 3 of them were pulling in 2 to 3 large fish each (they were using fishing lines with 3 hooks on them). No more than a minute after they casted their line in the water, 2 to 3 more fishers were reeling in 2 to 3 more fish and these were large fish. It went on and on. I couldn't believe what I was seeing. The amazement got the best of me and I asked one the fishers what was gong on. He said it was the Silver Bass spaning period, which last about 3 weeks and at that time, one could easily pull in hundreds of pounds of these fish in a day. Parking is incredible convenient. There is fantastic parking all along Riverside Drive that are right along the bike path with plenty of spots always available. The Riverfront Trail is unique among the City of Windsor's Bike Trails, in having service centres along its route. There are five service centres along the trail for restrooms, drinks, or eats.